Huawei, China’s cellphone and connectivity technology giant, and Inglobe Technologies, the leading Italian Mixed Reality company, continue their collaboration in developing Augmented Reality solutions to make operations more efficient. The collaboration aims at providing field engineers with innovative tools meant to reduce execution time and errors. One of the products on which a post-installation check solution has been deployed is the SUN2000-25KTL inverter, a piece of equipment employed in large industrial photovoltaic fields. A more recent application the Chinese manufacturer focused on regards the UPS2000-G installation procedures, used to power the network infrastructure support equipment. 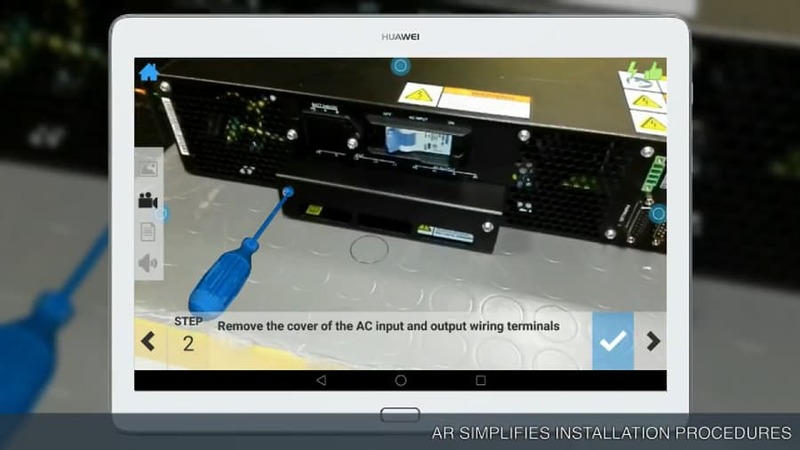 This scenario requires the technician to use step-by-step instructions with Augmented Reality graphic elements and animations to perform assembly and wiring operations, quickly and easily locating the intervention areas on the equipment and performing her technical assignments. During the process, the technician is supported in choosing the most suitable tools for executing individual tasks. The solution has been implemented by means of HyperIndustry. Hyperindustry is Inglobe Technologies’ Augmented Reality Platform for industrial enterprises. It is composed by two modules: a web-based backend that allows you to run the procedures authoring workflow; and a mobile client that can be deployed on iOS, Android, and wearable devices, allowing field technicians to receive directly assignments on their own devices and to synchronize the outcome of their activities on the platform.